I LOVE barbecue pork ribs. MMMMMMMMMMMMMMMMM. I am happy to try any barbecue place except for Texas style. Lucille's has been open in Rocklin for a while now, but I rarely head out that way anymore. (Used to live there when I was married.) Anyway, I decided it was time to organize a meetup dinner for out that direction and finally get it checked off of my To Eat List. There are so many types of barbecue in this country. You've got Memphis, Texas, Carolina, sweet, spicy, honey based, vinegar based, etc. 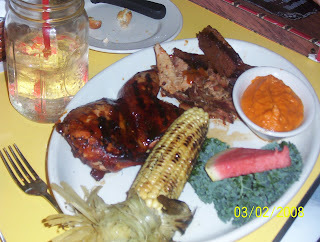 I believe Lucille's is Carolina barbecue - for the most part. After all, there were traces of Louisiana with the jambalaya and the gumbo. Anyway, I had made reservations for our group and was disappointed that we still ended up having to wait for quite some time at 6:00 (early)! I am big into baked goods and sweets. So I can appreciate a good quality biscuit. The biscuits are served up when you are seated and come with honey butter. I asked for regular butter. The biscuits are huge! And oh, so fresh, hot, and yummy! OK. Who likes okra? Raise your hands! I am one of those who grew up with bad okra experiences. My mom made some stewy dish with the slimy okra. Others at our table had never had okra. 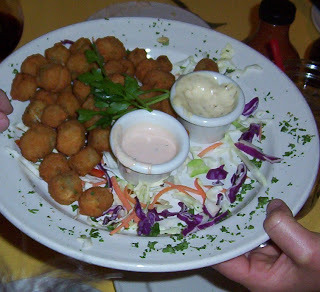 Connie ordered the fried okra (above) and was kind enough to share it with everyone. It was good! The okra was cut into small chunks that had been battered and deep fried and then served with dipping sauces. They were crisp, tasty, and not slimy. Well, maybe just a tad. But that was the beauty of it. Because of the small chunks, the amount of slime of the inside seeds was minimal and easy to tolerate. After all, okra's bad rap comes from the issue of texture. Dena told us that okra is in the cotton family - which makes sense. The inside of the pods have the slimy threads and seeds. Let's see - I mentioned 'slime' four times. Did I tell you okra is slimey? 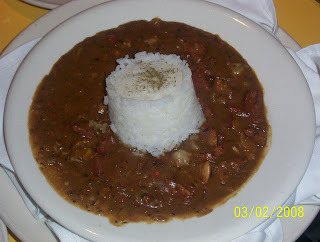 This dish was the small sized gumbo. Don't want to know how large a large is. Another tablemate (Mary?) was from Louisiana and said that gumbo has to pass the 'plop' test. If its runny and pours off the spoon, it ain't gumbo. Lucille's passed the test with a thick, peppery, chunky gumbo. I've always opted for jambalaya over gumbo, but admit that this was delicious. Since I was sharing I ordered a combo platter with a half chicken, pulled pork, beef brisket, corn, and mashed sweet potatoes. The chicken was smoke barbecued and very moist. I loved my grilled ear of corn. Grilling is definitely the best way to do corn. The beef brisket was good, but nothing special. The same can be said of the pulled pork. The big disappointment was the sweet potatoes. They were so pureed that it was like eating baby food. You want some chunkiness in any mashed potato so that you feel like you are really eating potatoes and not fakey potatoes. Yuk. I said I am a sweets person and so usually I do opt for a dessert. But the dessert menu was boring. It had typical fare like chocolate cake, apple pie, bread pudding, etc. Nothing struck my fancy. I had hoped for Red Velvet cake. Oh well. We all passed on dessert. I think I'll stick closer to home to my regular BBQ haunts. Lucille's was good, not outstanding. What it had going for it were a large menu and large helpings. What it lacked was quality in some items and a long wait!